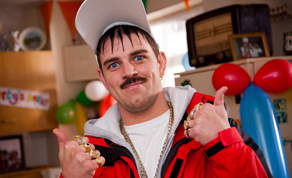 Andy Quirke will reprise his roles as both Damo and Ivor while Ronan and Rob Burke, who directed the second series of Damo & Ivor, are on board to direct the feature. Damo & Ivor is the satirical comedy, which first appeared on YouTube and RTE’s Republic of Telly back in 2011, about the lives of identical twin brothers separated not long after birth. One of the boys, Damo, is left to grow up on the mean streets of Dublin to be raised by his maternal Grandmother, Grano, while the other, Ivor, is given a life of wealth and luxury in Dublin's affluent Foxrock by parents who shower their son with money and little else.